The electronics industry is predicated on making small things big deals, and the latest small thing may be the biggest yet: supermaterials. Essentially just two-dimensional sheets of ordinary elements, a single atom thick, they’ve unlocked some truly astonishing properties that are only beginning to filter down into industrial and consumer electronics. 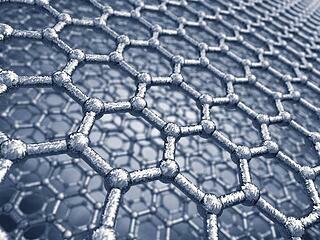 The most famous kid on the block is graphene, a mesh of carbon wires arranged in a grid-like structure. It may be one atom thick but it’s two-hundred times stronger than steel and more conductive than copper. Discovered in 2004, its potential applications include flexible display screens, ultra-high density computer flash memory, solar cells, and even foldable electric circuits, alongside optoelectronics, energy storage (including extending the life of lithium ion batteries, or offering a lighter alternative battery), and quantum computing. But graphene has very real limitations; as it lacks a band gap, it’s difficult to turn off and on, and so it’s hard to transmit all those ones and zeroes. So it’s not exactly perfect. And while graphene may have been the first 2D supermaterial, but it won’t be the last. Silicon is also getting in on the action in the form of silicene, which sits right below carbon on the periodic table and forms chemical bonds in a similar way, making it an obvious candidate. Silicene made its transistor debut in early 2015, something graphene (the world’s most conductive substance) is still struggling with. Of enormous potential is the tin-based supermaterial stanene. Finally manufactured in August 2015 several years after having been theorized, the study of the material is still in its infancy, but the substance is predicted to be a near-perfect conductor of electricity at temperatures of up to 100 degrees Celsius (212F). That makes it a major candidate to replace copper as the go-to material for computer circuitry, which would profoundly reduce heat buildup and improve computational efficiency, leading to faster, nimbler computers. In other words, the quest launched by the discovery of graphene in 2004 is bearing significant fruit – and is likely to continue doing so. The transformational effects of the wholesale replacement of copper or silicon in computer components, or the rise of silicene semiconductors, will open up new business opportunities for the right company that’s eager to grasp them. While these developments are still some time away, it’s imperative to stay atop these key advances as much as possible. Supermaterials like those described above are going to become a key component in major innovations in the future, and the manufacture, storage, and distribution of these materials are business niches that will need to be filled.